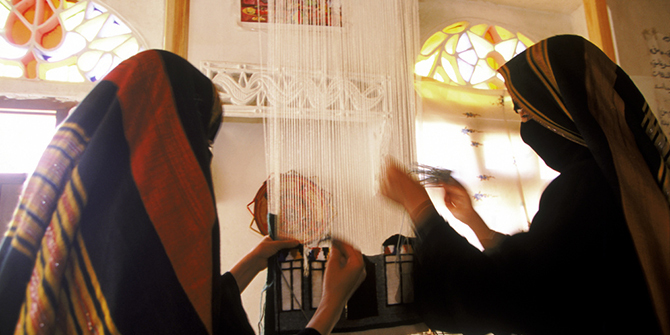 Young Yemeni women weaving. © World Bank Photo Collection. Nowadays, it is somewhat difficult to write anything positive about Yemen given the mutual rage and animosity between the factious groups who have done nothing but to intensify the harrowing stories of the already insecure country. Not surprising, a plethora of news stories both on social media and traditional media about Yemen has continued to focus on abject poverty, macabre deaths, and ferocious assaults. My aim of writing this article is not only to explore some of the stories not covered by the media but also to investigate a number of challenges faced by potential Yemeni entrepreneurs who dream of regaining the lost glory of their country. Imagine a country where infrastructural services such as electricity, fuel, and water are so dismal that it is almost a hopeless dream for anybody to fix them. Despite the arduous task of repairing these dilapidated amenities, some brilliant Yemenis are trying to improve the standard of living of Yemen through innovation and entrepreneurship. Moreover, some philanthropic organisations have created many commendable initiatives with the aim of encouraging Yemenis to shun partisan politics and avoid conflict. Such an inspiring initiative is touted at Block One, a website that aims to help potential Yemeni entrepreneurs fulfil their potential, finance their business plans and start-up ideas, and, above all, develop Yemen’s economy. Another inspiring initiative is the Youth Entrepreneurship programme initiated by SMPEPS. The purpose of the programme is to assist youths via educational sessions and career counselling, especially on how to become successful business owners. It is also inspiring that despite the incessant air strikes and drone attacks in Yemen, youths are still gathering and meeting frequently, as they conduct many events like TEDx in order to brainstorm and seek out profoundly innovative ways of improving Yemen’s economy. The Internet has also played a key role in all the initiatives and events mentioned above; most philanthropic organisations have extensively used social networking sites such as Facebook and Twitter to disseminate information even to the most remote areas. While proponents and opponents of the war in Yemen have used these digital platforms to propagate their sentiments, youth can also use these tools to escape from the harsh reality of the crisis. It is still early to judge if these initiatives can defuse the catastrophic situation in Yemen or if they can ameliorate the plights of the hapless youth who are supposedly inured to the conflict. Nonetheless, these initiatives are still a source of relief for some of the Yemenis who have decided not to take part in the bloody battles. Given the current situation in Yemen, the pertinent question is this: How can its citizens achieve their dreams? To what extent can these initiatives help Yemen? While the answers to these questions are at best debatable, I believe that these programmes and investments will, at least, have positive effects in the lives of Yemenis. Mazen Al-Hebshi is a Yemeni physician currently working with the International Committee of the Red Cross in Somalia with field experience in Nigeria and Yemen. He is also the curator of TEDxSanaa and PechaKucha Sana’a. He was TED ambassador for the Middle East in 2015. Mazen tweets @MazenAlHebshi. Shall we think of war victims as humans, not numbers? Bad Behavior has blocked 304 access attempts in the last 7 days.